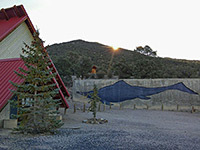 Berlin-Ichthyosaur is one of the most remote state parks in Nevada, 18 miles from the nearest major highway at the foot of the Shoshone Mountains near the center of the state, adjoining a unit of the Humboldt-Toiyabe National Forest. 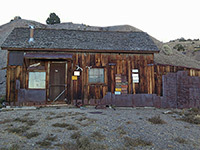 Contained within are two contrasting sites; the atmospheric remains of a late 19 century ghost town, serving a short-lived gold mine, and an exposed limestone rockface holding several complete, unexcavated ichthyosaur fossils, protected beneath a metal building. The sites are two miles apart, by road; the town of Berlin sits at the edge of the mountains, looking out over a typically wide, empty Nevada basin (Ione Valley), while the ichthyosaurs are slightly higher in elevation, in partly wooded terrain along a shallow canyon. The fossils can be viewed in just a few minutes, through external windows, or as part of a 40 minute tour that enters the building, while the town is quite extensive, with around 20 structures and various mine relics, so needs an hour or two. Besides these two main attractions, the state park also has a campground, four short trails and one longer hiking loop. 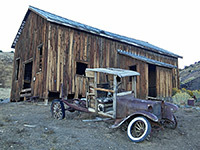 The buildings at Berlin present a characteristically aged, weather-beaten appearance, the wood and rusty iron assuming rich shades of red and brown, and the overall appearance, and setting, is reminiscent of perhaps the most famous western ghost town, Bodie in California, though this place is much larger. Like Bodie, some of the houses in Berlin still contain their original contents. Berlin-Ichthyosaur State Park is reached by a 2 mile gravel track, usually fine for all vehicles, which forks off Highway 844 at the end of its paved section, 16 miles from the busier Highway 361, which links US 50 with US 95 east of Hawthorne. Road 844 climbs to a pass in the Paradise Range, also part of Humboldt-Toiyabe National Forest, then descends into Ione Valley, now heading towards the higher peaks of the Shoshone Mountains; after the state park junction, the road, now unpaved, turns away northwards and later crosses the mountains, after passing another interesting ghost town, Ione. The state park road first reaches Berlin, passing through the old town center, then continues to the fossil location. Surviving buildings in Berlin include the machine house, assay office, stable, winch house serving Berlin mine, 30-stamp mill, stage station and several residential cabins. Most are right beside the road, while just a few are little way up the hillside, and all may be seen along the 0.9 mile Berlin Townsite Loop. The 0.3 mile Cemetery Trail leads slightly downhill to a small graveyard, in the middle of a stony plain, while the 0.4 mile Diana Mine Loop visits an adit to the north. All the other shafts and openings in the area are fenced off and dangerous to enter, though Diana mine is open for tours, which penetrate about 500 feet underground, as far as a junction with a tunnel from Berlin mine. The town of Berlin was founded in 1897, a year after discovery of gold in the adjacent hills, and at its peak had around 75 buildings and 350 residents. 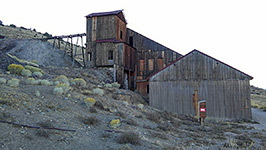 The settlement was abandoned soon after the ore was exhausted (in 1911), though the most important structures were still maintained by the owners, the Nevada Company, and as a result they have a good state of preservation. The site was transferred to the state in 1970. Fossils of the ichthyosaur, a marine reptile from the late Triassic period, were discovered near Berlin in the 1920s, and when excavations were completed few decades later, around 40 specimens had been unearthed. One group was left in situ, and has been enclosed within a metal building, the Fossil House. 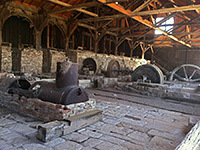 Tours are provided twice daily, 10 am and 2 pm, Memorial Day through Labor Day, plus weekends only at some other times. Nearby is a day use area and two trails, one a short nature path to the 14-site park campground (suitable for RVs up to 25 feet in length), the other a 2 mile loop along Richmond Canyon to the east.